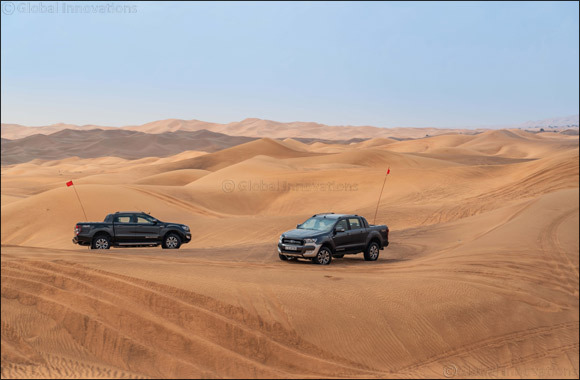 Dubai, UAE, December 05, 2018: The wide-open desert is the perfect playground for off-roaders but there are a few things to bear in mind when venturing into the dunes as part of a group for the first time. Pacing and spacing is the subject of the fourth episode of Ford’s Desert Driving Tips series – and mastering both will make your desert drive a lot more relaxed and enjoyable. Determining just how much space to leave will come with experience – but a good rule of thumb is to ensure you can stop safely should the car up ahead suddenly stop moving, or get stuck. Crowding the car in front will often limit your options and may even lead to you getting stuck too. There are points at which you need to remain vigilant, particularly when the convoy slows to clear an obstacle or the crest of a dune. Be prepared to stop and wait for your turn. While it’s tempting to hit the dunes with lots of speed and enthusiasm, it’s best to take a measured approach to avoid any damage to your car. “The speed that you will want to maintain will vary on how soft the sand is: the softer, the sand, the more momentum you’ll have to carry to help keep the car moving forward without it bogging down and getting stuck. If you’re on firmer sand, you can slow those speeds down and enjoy the view and have a safe and enjoyable time out here in the desert,” Chavez said.